Implement UDA ConstructionNet as a part of the complete ConstructionSuite system, and take control of project management with advanced construction Estimating software, critical-path Scheduling, dynamic QuickBooks Integration, and a comprehensive library of detailed Contracts and Specifications. 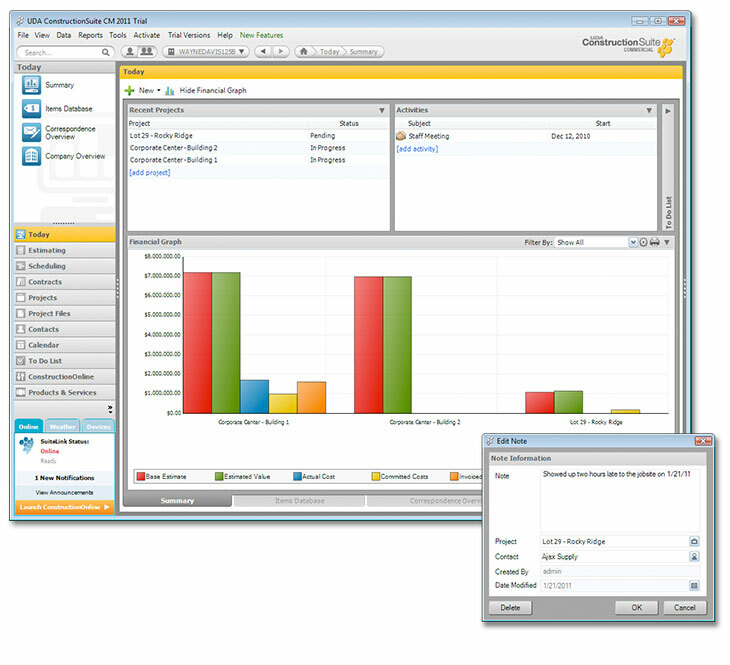 As the first CRM (company resource management) application developed solely for the construction industry, ConstructionNet enables you to leverage Contact and Project Information, Certificate and Lead Tracking, Project and Contact Associations, Activities and To Dos, and advanced Calendar functions to turn complex information into a sleek and streamlined system. Create connections across Contacts, Estimates, Schedules, Contracts, Specifications, Activities, To Dos, Certificates, Workflows, and Dimension Sets. Take Project Management to the next level, and create dynamic links between all of your project-related information. Organize and manage all of your company's Activities and To Dos with two dynamic utilities that link tasks and to do items with contacts or projects. Maximize information sharing between your essential office programs with UDA ContactSync, a three-way contact synchronization between ConstructionSuite, Microsoft Outlook, and QuickBooks. Keep your contact lists updated with automatic synchronizations. Leverage bi-directional calendar synchronization with AppointmentSync to merge the UDA Integrated Calendar with Microsoft Outlook, and take your calendar with you in the field on a pocket PC or PDA. Automated Workflow Management tools keep each of your projects progressing smoothly. 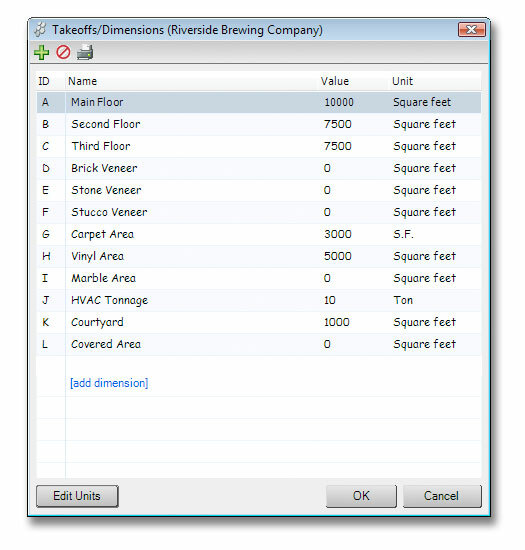 Associate Takeoff/Dimension sets with project types, and utilize this dynamic feature to increase your estimating speed and accuracy. Use Insurance Tracking to ensure that all of your project resources such as vendors and subcontractors have valid Insurance, Licenses, or Bonds before scheduling or paying them. Enter, track, and manage leads effectively with Lead Management. Financial Charts allows you to see at a glance the comparison between your estimated values and actual costs for every project. Certificate Email Reminders automatically notify your subcontractors that you need updated insurance, license, or bond information. 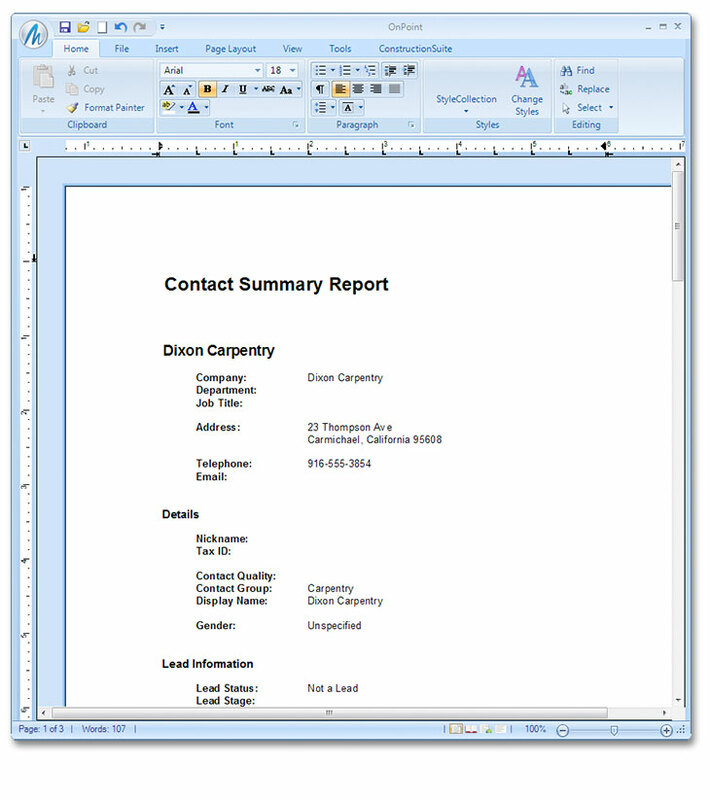 Project Summary Reports detail all of your projects' vital information - including dimensions, related contacts, estimated value and actual costs to quickly give you the information you need. Custom Fields can be added for your projects, contacts, and company to track any additional information in the ConstructionSuite system. Certificate Expiration Reports list your contacts' insurance, licenses, and/or bonds so it's easy to see which subcontractors have valid, expired, or missing certificates. UDA SyncCenter keeps you organized by synchronizing your project and contact information with other ConstructionSuite users, Microsoft Outlook, or QuickBooks. Lead Reminders automatically notify you of Lead Callback dates, Expiration Dates, and Forecast Dates, so you never miss an important phone call again. Contact Summary Reports allow you to create and print a variety of detailed contact lists, including potential job leads, project associations, contact groups, or a complete list of the contacts stored within ConstructionSuite. Archive completed or non-awarded projects for future reference and keep your Project List organized and up-to-date. 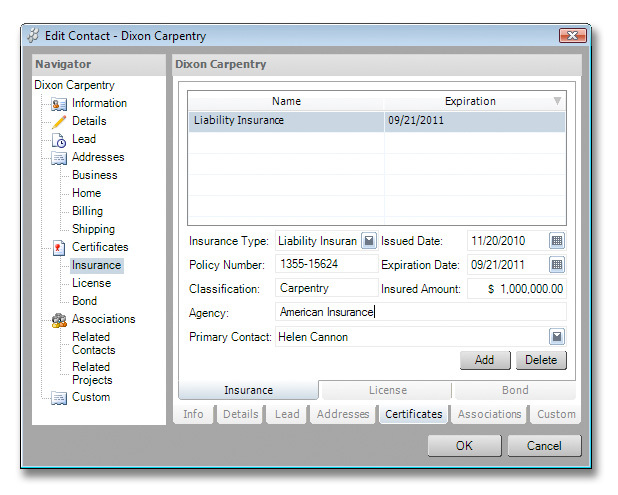 Export Calendar to HTML allows you to share your Construction Calendar with clients, subcontractors, lenders, and more. Permissions allow you to assign employees access to view and/or edit information for certain projects or files, or completely restrict access to specific projects or files. If there's one thing all construction firms have in common, it's that each project requires an immense amount of information to be completed successfully. Even if you only manage a few projects a year, you're bound to need more organization than off-the-shelf software can provide. Take information management, storage, and retrieval to the next level with integrated Project tools in ConstructionSuite. Keep project information organized by creating a Project for each new job you start. Easily access, view, and edit project-specific information such as Related Contacts, Project Log, Workflows, Change Orders, Applications for Payment, and more. Develop a comprehensive record of all projects, files, and contacts. Use UDA Projects with advanced Workflows to ensure each step in the process gets completed on time. Easily backup and synchronize Project information using UDA ProjectBackup and UDA ProjectSync. 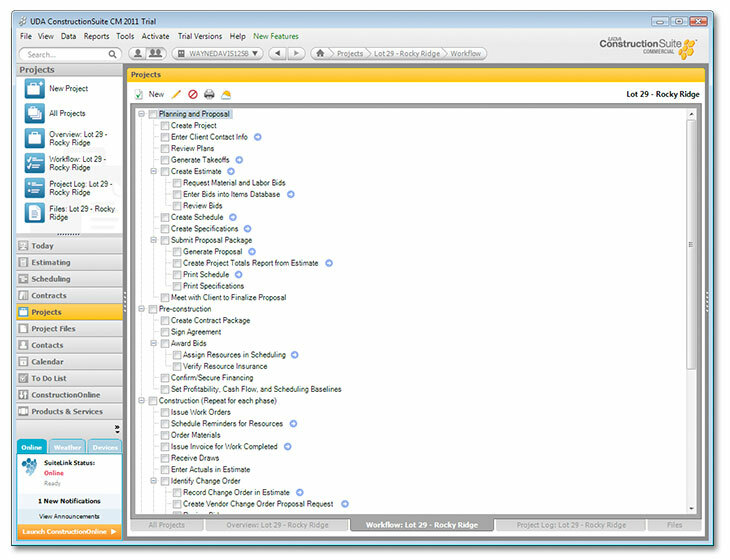 Import Projects into the ConstructionSuite database to continue utilizing current project documents. Managing your company's contacts can be a daunting task, even for the smallest firm. But UDA Contacts offers more than just a way to store contact information. Revolutionary Contact Management turns the overwhelming task of keeping up with vendors, suppliers, subcontractors, and clients into a smooth process that incorporates unlimited storage capacity and ground-breaking integration capabilities. 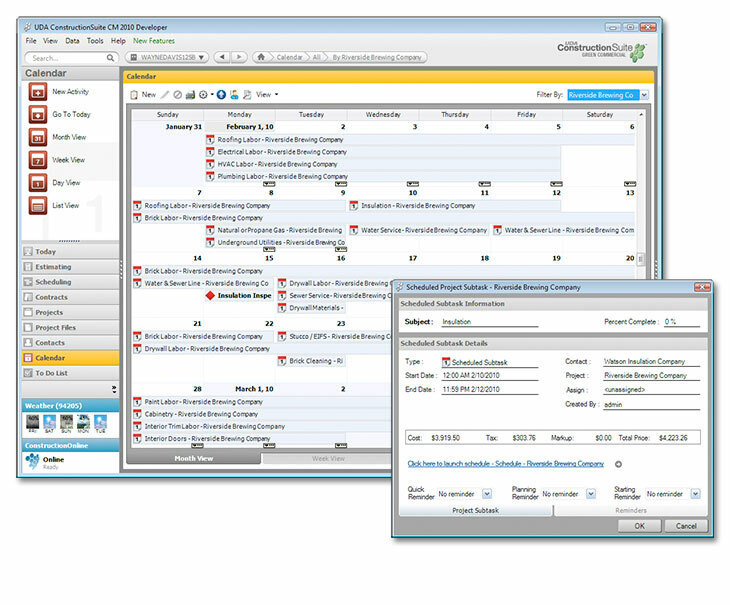 Benefit from fully integrated contact management with your Projects, Activities, To Dos, Estimates, Schedules, Contracts, Specifications, Insurance Tracking, Lead Management, Items Database and your ConstructionSuite files. Assign contacts throughout UDA Estimates and Schedules with UDA Resource Allocation to ensure timely completion of projects. Automatically email reminders to project resources to keep your suppliers and vendors on time. Use the Document Management Wizard to import contact information into ConstructionSuite documents and avoid time-consuming entry tasks. Track Certificates such as Insurance, Licenses, and Bonds to protect your company from undue financial liability. Enter and manage leads to boost sales and profits for your company. 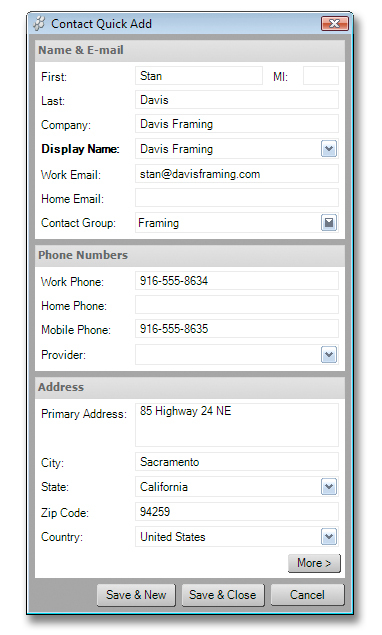 Take advantage of powerful features such as Contact Groups and Project Associations to keep your contacts organized. Synchronize UDA Contacts with essential office programs such as Microsoft Outlook and QuickBooks to maximize your time by eliminating tedious double entry tasks. 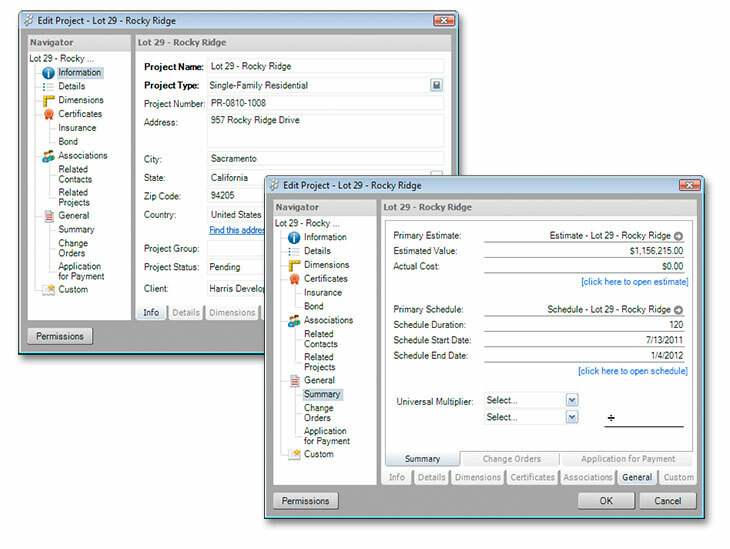 Create Customized QuickBooks Purchase Orders from your construction estimate with optional Filter by Vendor. Connect the power of ConstructionNet CRM to all of your construction estimates and schedules with UDA Resource Allocation, a powerful new utility that enables you to assign subcontractors and vendors to your project tasks, create resource-specific reports, and automatically send reminders. Avoid costly delays caused by double-booked resources, and ensure that your subs have valid insurance, license, and bond certificates by using UDA Resource Allocation in each of your project schedules and estimates. 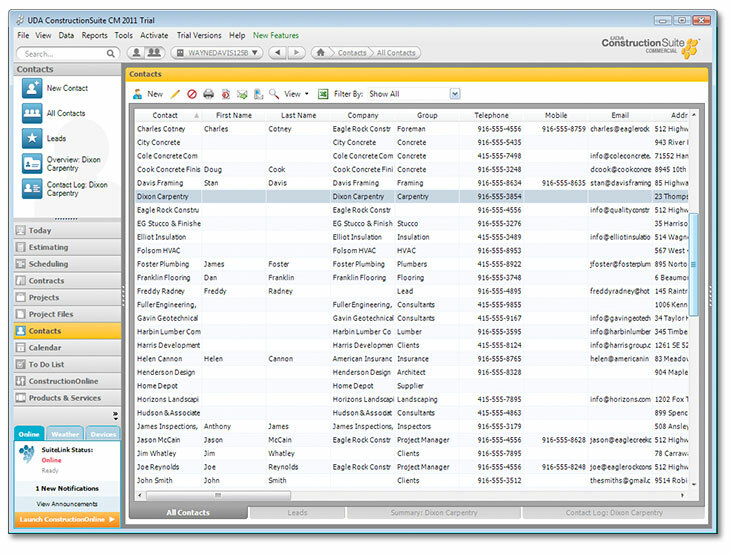 ConstructionSuite Activities offer a dynamic method to create appointments that work in conjunction with Projects, Contacts, and the Construction Calendar. With this advanced system, you can easily see what Activities need to be completed, making it easy for you to keep everything on track. You can also synchronize ConstructionSuite Activities with the Outlook Calendar and then take them with you in the field via a pocket PC or PDA. You know that between keeping your company organized and completing your projects on time, there's a lot to do and a lot to keep track of. The ConstructionSuite system is designed to give you as many options as possible to help your company stay on track. Create a To Do List and link items to contact or projects to keep your business moving day-to-day. As a central location for all of your project information, the Aggregate Reporting system enables you to compile and organize comprehensive data about your projects and developments. Multi-project capabilities bring together information across the ConstructionSuite database, including total number of projects, start and end dates, total scheduled days, estimated cost, actual cost, and an array of options for each project. 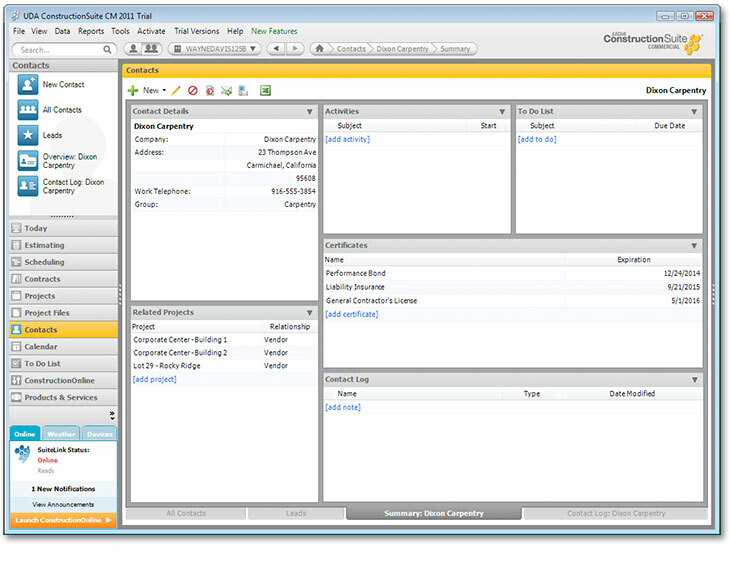 *Full versions of ConstructionNet CRM are available in ConstructionSuite CM Contractor and above. 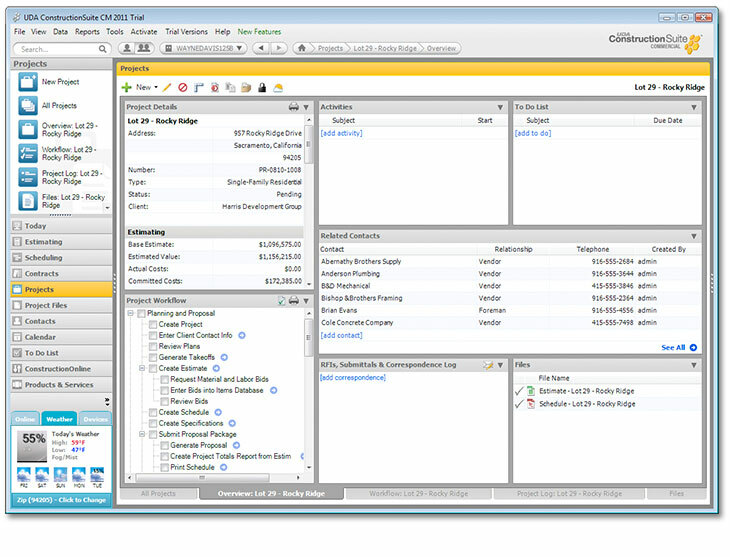 The Lite version of ConstructionSuite CM includes ConstructionNet Lite - which provides basic project and contact management features without Resource Allocation, Activities, To Dos, and Workflows.